Atopic dermatitis or eczema are very common today, together with allergic reactions in contact dermatitis. Distinguish between these, see symptoms and natural ways to help healing these. Atopic Dermatitis or Eczema – is an inflammation of the epidermis, the outer layer of the skin, causing common skin rashes. Symptoms of eczema are characterized by dryness and skin rash, redness, itching, blistering, cracking of the skin, oozing and bleeding. Rash diagnosis is made based on these aspects by a dermatologist. 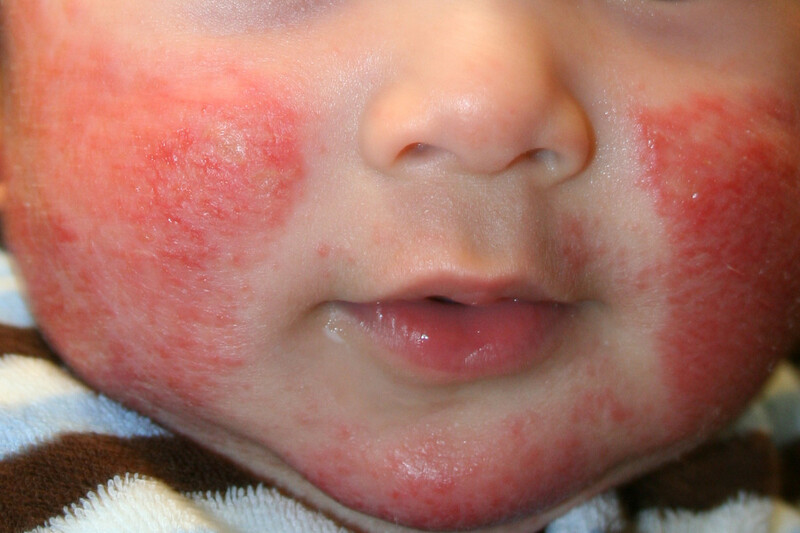 Infant eczema is very common and appears in general in the skin folds and face. Studies show that over 70 percent of children with severe eczema develop asthma, months or years later. Medications for eczema are generally corticosteroids that are highly effective in suppressing the symptoms but they also have tremendous side effects. Other medication includes topical and system immunosuppressants, antihistamine and anti-itch drugs. Eczema can get easily infected once the skin barrier is broken and bacteria can enter under the skin. In this case, topical or oral antibiotics will be necessary. Another type of dermatitis is contact dermatitis and is caused by an allergic reaction. Here the immune system is involved when, after you touch something, your immune system overreacts by producing antibodies to fight the invaders. Allergic reaction triggers can be poison ivy, nettle, poison oak, latex, different fruits and nuts, cosmetics, topical medications, etc. Irritant contact dermatitis have the tendancy to be more painful than itchy. Skin may blister and raised red patches may appear. use oatmeal baths – 4 cups oatmeal in a fine net in the bath or blend the oatmeal in a food processor until you have a very fine powder that can be sprinkle in the tub; you can also add 1 cup of baking soda or Epsom salt to a tub of lukewarm water. use pharmaceutical grade Epsom salt and Natural Rock Salt baths. Epsom salt is strongly hydroscopic and together with the other rock salt properties, cicatrizant, anti-inflammatory and anti-bacterial, helps to heal the wounds and relieve the itching. use cold pressed virgin coconut oil. For contact dermatitis, wash your skin with a mild soap and cold water and apply cold compresses; tea tree oil applied on the skin rash will calm the pain and promotes healing. Calamine mixture is also very good to calm itching (anti-pruritic) and is a mild antiseptic and astringent as well, preventing infections and helping in healing.